Honipack Sheets are available in a broad variety such as: Honipack Void fillers, -Dunnage, -Separators, -Spacers and Honipack Void Formers. 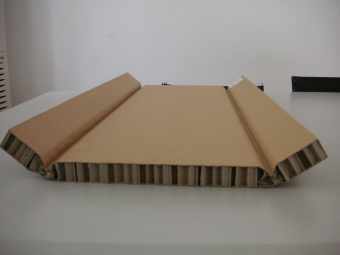 Honipack Sheets are environmental friendly and guarantee damage free transports of almost any product. Honipack Sheets have excellent separating, stabilising and protecting properties. 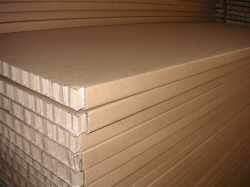 Honipack Sheets are easy to handle and comply with high levels of energy absorption. Honipack Sheets are entirely made of recycled paper and are 100% recyclable. With Honipack Dunnage, -Separators and -Spacers it is easy to pack and handle products in a safe manner and avoid damage and loss during transport and shipping. Honipack Dunnage Sheets are used as void fillers in trucks and containers and are ideal stabilisers for protecting even the most delicate consignments, including fragile products like glass. During transport, Honipack Void Fillers stabilise loads, preventing stacks from shifting or knocking down in the event of sudden braking, swerving or accidental impact. Honipack Void Fillers as a consequence contribute to improved driver safety. Honipack Separators stabilise and separate individual items and has high level protecting properties. Honipack separators and spacers are widely used in various industries, like domestic appliance, glass, yarn, doors and furniture and even the marble industry. Honipack Void Formers are made of sheets of laminated paper honeycomb and are used as formwork or shuttering for concrete and gypsum. Honipack Void Formers minimize damage risks posed by natural shrinkable clay soils. Honipack Void Formers are unique, environmentally friendly foundation stabilisers. Honipack Void Formers consists of a biodegradable Honicel paper honeycomb core, set between lightweight polypropylene facings. In dry conditions Honipack Void Formers are strong enough to support the weight of wet concrete with steel reinforcement. When concrete is set and water is introduced into Honipack Void Formers, the paper honeycomb core of Honipack Void Formers will degrade and ultimately create a void. This void will accommodate clay expansion without exerting undue pressure on the structure below and continues to accommodate natural soil shrinkage and expansion.